The Booster Club provides a platform for any extra-curricular activity at Issaquah High School to run fundraisers to support their program. All fundraising efforts below are approved as dedicated fundraisers for that specific program. The Booster Club relies on Membership dues every year to fund grants, scholarships and recognition activities. If you are not a Booster Club member, we hope you will consider joining today! Double your donation with Corporate Matching! <-- click button to make a donation. Don’t let valuable school donations go to waste! Click here to learn if your organization has a gift matching program. “Passing the Hat” As busy families, fundraising should be easy: No cookie dough, discount cards, wrapping paper. Simply, donate, through the Designated Donations button below to support our girls. Most importantly, 100% of your tax deductible donation goes directly to support IHS Girls Fastpitch Softball. (Checks write out to “IHS Boosters,” with “Softball Fundraiser” in item line.) Questions, email IHS Fastpitch Boosters-Tracie Jones, Sophias_maid@yahoo.com. ANOTHER OPTION that also supports the ladies...IHS Fastpitch’s cleaning out the lockers, selling Vintage Gear! 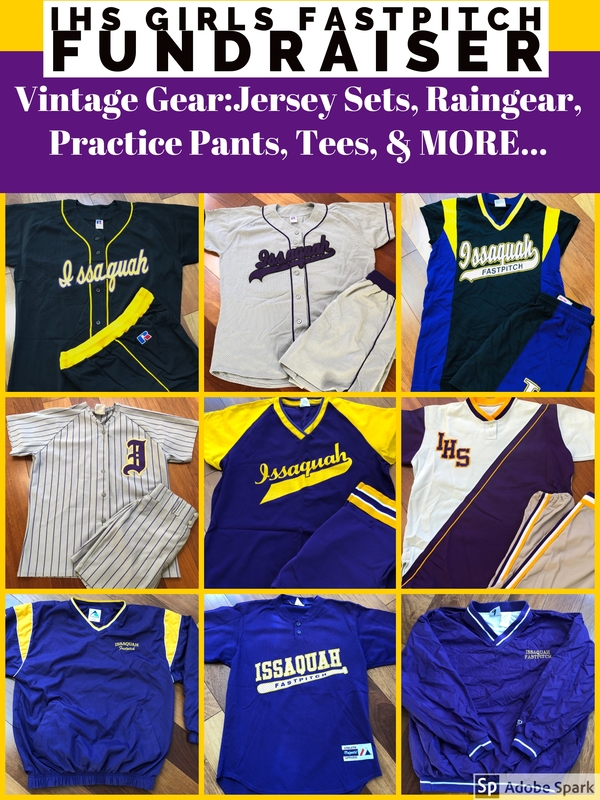 Families can purchase some cool, game-issued, genuine Issaquah sports jerseys, & other gear! Fastpitch gear is a GREAT way to show support for ALL IHS teams! Interested, questions, email IHS Fastpitch Boosters-Tracie Jones, Sophias_maid@yahoo.com. <-- Click here to look at available gear: rain jackets, pants, practice pants, retro tees, and more. Your ALLL SCHOOL Booster Club provides financially supports and promotes ALL sports, ALLclubs and ALLactivities that represent Issaquah High School. Through Grants, Scholarships and Athletic Awards. It promotes a positive imagethrough the BoosterBuzz, Facebook, its Website, Awards, and “Another Eagle Goes to STATE” signs. It provides a safe support structure for dedicated fundraising. Join Booster Club todaywith a $50 minimum donation. 96% of donor dollars go to grants and scholarships. “Like”the Booster Club Facebook page to stay informed. Opt-Into electronic communication, which includes the BoosterBuzzand meeting notices. Promotethe important benefits of Booster Club with your Issaquah community. All membership donations are 100% tax deductible.